March 5, 2018 – Toronto, Ontario: Royal Road Minerals Limited (TSXV:RYR) (“Royal Road” or the “Company”) is pleased to announce that it (the “Purchaser”) has entered into a definitive stock purchase agreement (the “Agreement”) with Compañía Kedahda Limited (the “Seller”), an affiliate of AngloGold Ashanti Limited (“AngloGold Ashanti”), to acquire Northern Colombia Holdings Limited (“NC Holdings”). NC Holdings in turn owns Exploraciones Northern Colombia SAS (“ENC”) which owns a title package (collectively, the “Titles”) comprised of mining concession agreements covering approximately 36,000 hectares of land, and the rights with respect to applications that have been made to acquire mining concessions over approximately 215,000 hectares of land, in prospective mineral belts in the Nariño, Cauca and Antioquia departments of Colombia (the “Transaction”). High quality, Appraised and Prioritized Title Package. AngloGold Ashanti has elected to focus on its three advanced projects in Colombia and in Q2 of 2018, commenced a sales process for its exploration title packages outside of these three principal projects including the Titles as held under NC Holdings and ENC. These title packages are the result of systematic exploration, appraisal, prioritization and the purposeful reduction of land holdings by AngloGold Ashanti over the years since inception of its activities in Colombia in 2004. 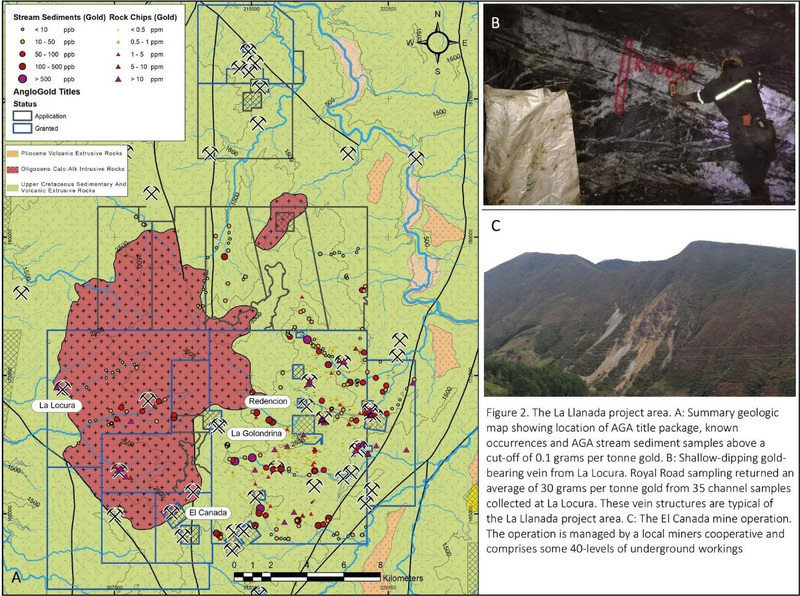 The Güinter sheeted quartz-calcite-sulfide vein project area in Antioquia. The vein system has been mapped over 6 square kilometers, AngloGold Ashanti drilled 10 scout diamond drill holes for a total of 5662 meters at the project and reported best intersections of 56 meters at 1.1, 14 meters at 1.8 and 20 meters at 1.8 grams per tonne gold (not true thickness). 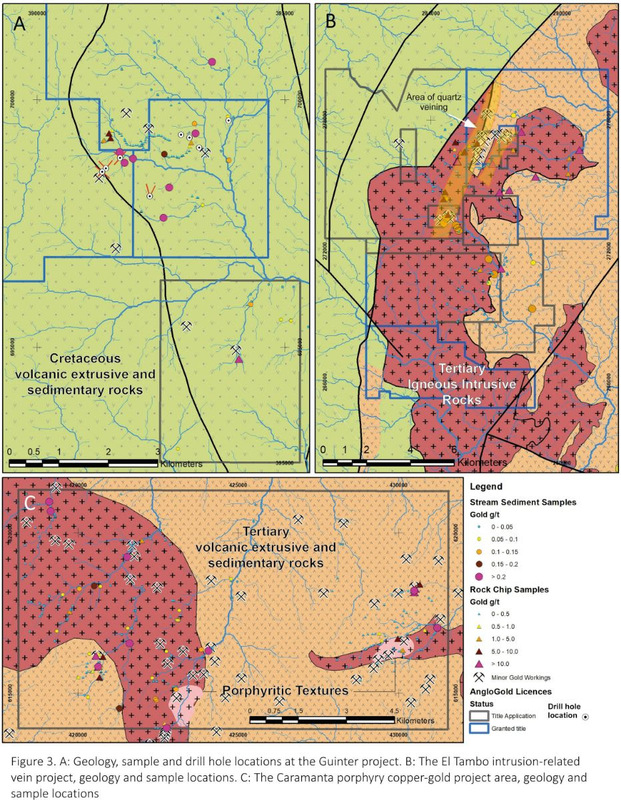 Based on geological observations management believe there is volume potential in mineralized stratabound horizons and potential for higher-grade mineralization where veins link and interact similar in style to the nearby Buriticá and Anzá projects (Figure 3). All figures are in United States dollars unless otherwise indicated. Under the terms of the Agreement, the Purchaser agreed to acquire from the Seller all of the issued and outstanding shares of NC Holdings. NC Holdings indirectly holds, through two wholly owned subsidiaries, all of the issued and outstanding shares of ENC, which is the holder of the mineral concession Titles and is the assignee of the rights to any Titles that are granted to AngloGold Ashanti Colombia S.A. (the “Assigning Company”), an affiliate of Anglo Ashanti, pursuant to title applications made by the Assigning Company to the National Mining Agency of Colombia (Agencia Nacional de Minería). a further aggregate amount equal to twenty million dollars ($20,000,000), payable in four equal installments of five million dollars ($5,000,000) on the date that is 90 days following the end of each of the Company’s four consecutive fiscal quarters immediately following the commencement of commercial production for the Specific Project. An amount equal to the aggregate sum of all exploration expenditures funded by Royal Road Minerals for that Specific Project from the feasibility option date until the completion of the transfer of the purchased interest. If the Seller exercises the Feasibility Option for a Specific Project, then the Company will no longer be required to pay the payments on and following commercial production for the Specific Project for which the Seller has exercised the Feasibility Option. the Company shall have obtained any required approvals of the TSX Venture Exchange and the relevant authorities in Jersey in connection with the acquisition contemplated by this Agreement. The Seller shall have obtained the required approval to implement the Transaction from the South African Reserve Bank. The Transaction is expected to close on or before the date that is 60-days from March 4th 2019, subject to the approval of the TSX Venture Exchange and the other conditions precedent set out in the Agreement. The information in this news release was approved by Dr. Tim Coughlin, BSc (Geology), MSc (Exploration and Mining), PhD (Structural Geology), FAusIMM, President and Chief Executive Officer of Royal Road Minerals Limited and a qualified person as defined by National Instrument 43-101. 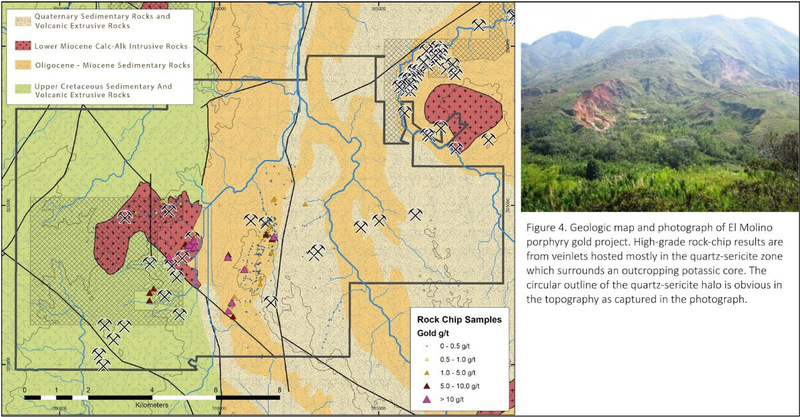 The El Molino porphyry gold project (Figure 4) is an outcropping gold porphyry system located in Cauca Province. Both the potassic core and quartz-sericite halo of the system are exposed on surface. AngloGold Ashanti previously reported sheeted gold veinlets returning rock-chip samples of up to 184 grams per tonne gold (based on a reported 493 combined grab and panel samples ranging from below detection limit with a mean of 2.5 grams per tonne gold; Figure 3). 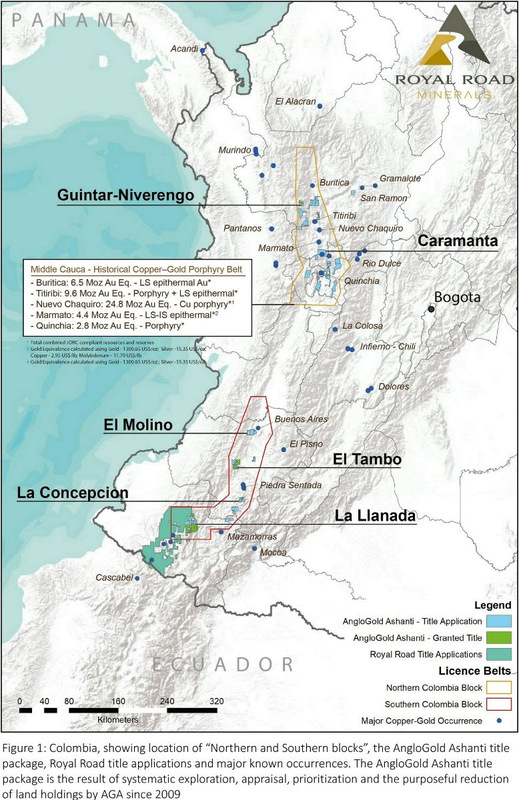 The Caramanta region in Antioquia, where AngloGold Ashanti reported three copper and gold bearing porphyry bodies and rock-chip results of up to 47 grams per tonne gold and 3.3% copper (based on 255 combined grab and panel samples ranging from below detection limit with a mean of 0.65 grams per tonne gold and 0.07% copper). The foregoing exploration information and data contained in this news release was not prepared by the Company or the qualified person named below. Neither the Company nor such qualified person has independently verified the foregoing exploration results and data and the Company cautions that there is a risk that further exploration will not produce similar results.